How Can You Prove Fault In a Slip-and-Fall Accident? Every day, residents in New Jersey enter the properties of others. While this appears to be a simple and relatively safe and routine action, a patron or visitor could be seriously injured when a property owner is negligent. Even a simple act of negligence could cause even the safest building or home to turn into dangerous property. A property owner could be to blame for a serious slip-and-fall incident; however, those harmed need to prove he or she was responsible. How Can You Prove Fault? How can you prove fault in a slip-and-fall accident? Even when it is easy to indicate and prove what caused a victim to fall on the property of another, it is not always easy to prove that the property owner was responsible for the dangerous property condition that led to the slip and fall injury. In order to prove fault, there are some important factors to consider. First, could the property owner have taken steps to prevent the accident in question? Or put another way, could the accident have been avoided if the property owner was more careful? If there is evidence that a property owner did not take steps to avoid or protect against the hazard that caused the slip-and-fall incident, then this could indicate fault. >>Contact New Jersey Slip and Fall Attorneys Today! However, in situations where the owner took steps to reduce or prevent such an incident, it may preclude them from having complete liability. For example, if a leaky roof led to the wet floor that caused the slip-and-fall, but the property owner installed a drainage grate to limit slippery conditions, this could alleviate responsibility. People who suffer slip-and-fall injuries on someone else's property should consider three things. First, it should be understood if the property owner should have known about the dangerous condition because a reasonable person in their position would have known about it and fixed it. Second, the injured person needs to know whether the property owner was aware of the dangerous condition but did nothing to repair or fix it. Lastly, it should be considered whether the property owner caused the dangerous conditions on the property. If any of these three conditions are proven, it is possible to place responsibility on the property owner. Under these circumstances, a premises liability claim can help injured victims recover compensation to cover expenses arising from the incident. 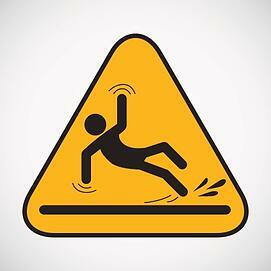 If you need help with a slip and fall accident contact our New Jersey slip and fall attorneys today.